CAIRO – In the time of World War 2 motorcycle has become one of the operational vehicles used by the armies of Europe. Now, the existence of the bike is very rare to find. Sea of ​​Egypt is one of the pathways that are often passed the soldiers of Europe towards Asia. 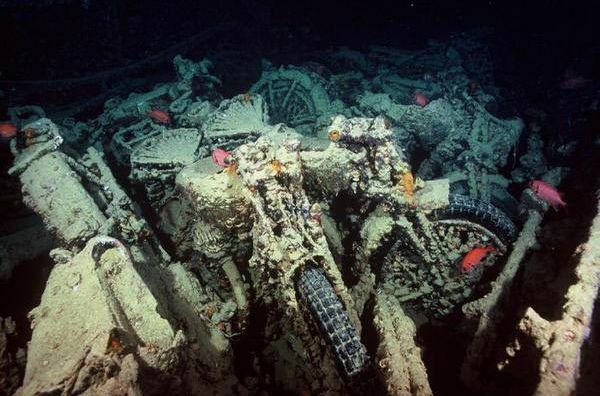 This sea also found the former British ships that sank.This fateful ship one vehicle contains a lot of military motorcycles. World War 2 military motorcycle heritage found rotting under the sea is 20 M BSA,Matchless and Norton G3L 16 Hs. These motors are found waters near Egypt’sSharm El Sheikh a resort popular in Egypt. seen in the image of military motorsare neatly lined up and was overgrown with corals. As reported by Motorcyclenews, these motors allegedly loading cargo ship SSThistlegorm British. In this ship there is also a British army trucks and eventrains. All is lost when the ship sank in 1941 due to the bombing by the Germans. ~ by ickerz on 15 August 2011.